The field of strategic management has developed significantly since its birth from "business policy" and "business planning" in the 1960s. Pioneering studies were essentially normative, prescriptive, and often based on in-depth case studies. The evolution of strategic management into a respected field of academic study resulted from the adoption of research methods previously employed in economics. Today, research in strategic management is likely to employ a mixture of methods borrowed from related and unrelated disciplines, such as politcal sciences, psychology, neuroscience, and behavioral economics, which can be confusing to researchers new to the field. This book provides the reader with a broad introduction to the array of qualitative and quantitative research methods required to investigate strategic management. Throughout the book, strong emphasis is placed on practical applications that transcend the mere analysis of the theoretical roots of single research methods. The underlying result is a book that encourages and aids readers to "learn by doing" – in applying the implications of each chapter to their own research. 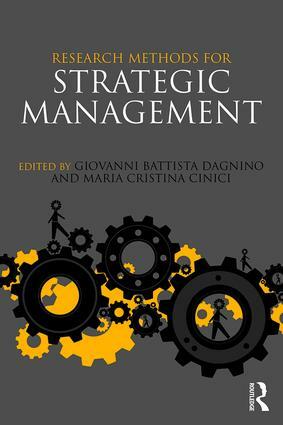 This text is vital reading for postgraduate students and researchers focused on business strategy.